This one passed me by, and in a way, I can understand why, because at first sight it appears to be nothing more than a thinly-disguised puff for the Rapala Corporation. Well, it isn’t the first time I have made the mistake of judging a book by its cover and my apologies are due to the author, because this is about as good a read as you are likely to get, at least as far as lures are concerned. The book is more or less divided into two parts, one section following another, so that as you read, you get a slice of Rapala’s history, followed by a few pages about the current range of lures, before going back to the story of the company again. 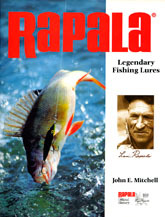 The trouble is that lures are so enticing that the first time I opened the book, I completely missed the historical sections, which is why I am kicking myself, because very few businesses of any description have a story to tell anything like as interesting as Rapala’s. The company was founded by Lauri Rapala, a man without a trade or much of an income, who didn’t learn to read or write until he was in his twenties; but he was a keen fisherman, who carved his own lures because he had no other choice. What happened next is fairy tale stuff. The fame of his lures spread, until Lauri began to realise that he had more of a future selling them than he did labouring on farms, and he started what for many years was a truly family business shortly after the end of the Second World War. Thanks in part to a stroke of fortune which happened when Time magazine published a feature about Rapala in the same issue as it happened to cover the suicide of Marilyn Monroe, the company grew at a tremendous rate, particularly in the US, and by 1988, the factory had produced 100 million lures, a figure which it has probably doubled by now. It is an incredible story and one that is well worth reading - and you get to gloat over the modern range of lures, which is impressive. Makes you want to go out and buy some… Amazon have it on discount, but Coch-y-bonddhu have it for about half the price, which is a steal.